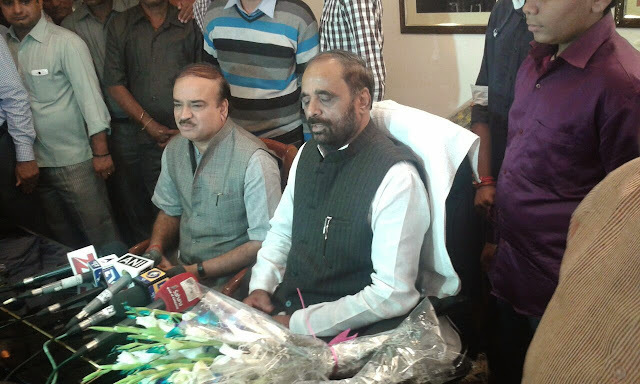 Shri Hansraj Gangaram Ahir, BJP MP from Chandrapur is popularly known as 'Coal Nayak' for his unearthing coal scam. He is also the recipient of 'Sansad Ratna Award' for the past five years continuously for his consistent outstanding performance in the 15th Lok Sabha. During May 2014, he was elected as MP for fourth time from Chandrapur (Maharashtra). Today (11th Novmber 2014) Shri Hansraj Ahir completes 60. On this day, he also takes charge as Minister of State in the Ministry of Chemicals and Fertilisers. Prime Point Foundation and the editorial team of ezines PreSense and New Gen Thamizhan congratulate him for his achievement. We pray His Almighty to bless him for his continued dedicated service to the Nation in the new role. It is worth reading an article in The Hindu (11 Nov 2014). By roping in Chandrapur MP Hansraj Gangaram Ahir, nicknamed ‘coal nayak’ for exposing the coal block allocation scam, Prime Minister Narendra Modi has achieved two objectives. The Prime Minister, by bringing him into the Union Council of Ministers, has sent out a signal that his government means business on the issue of probity in public life. Secondly, Mr. Modi has sent out a message that the development of the Vidarbha region in Maharashtra, which has witnessed sporadic but peaceful agitations for a separate State for a long time, is one of the top items on the agenda of his government. Mr. Ahir is a prominent leader from the region. The BJP was one of the national parties that at one time had supported the demand for a separate Vidarbha. The first BJP Chief Minister of the State, Devendra Fadnavis, is also from this region. The State unit of the party in general and Mr. Fadnavis in particular were in a spot when Mr. Modi, in one of his very first Assembly election rallies, had emphatically declared that Maharashtra would not be divided as long as he was in power. Mr. Modi’s stance was seen as a counter to the campaign by the Shiv Sena that the BJP, if elected to power, would carve out a State of Vidarbha. With Mr. Fadnavis as the Chief Minister, Nitin Gadkari (who is an MP from Nagpur) as Cabinet Minister and now Mr. Ahir as a Minister of State, the Prime Minister has ensured that Vidarbha is at the centre stage of politics.